Diablo 2 Remaster Might Be In The Works | Nerd Much? According to a recent job posting from Blizzard for a Lead Software Engineer, it seems that a Diablo 2 remaster might be beginning development soon. This is all pure speculation, of course, but after the Blizzard revealed Starcraft: Remastered, many fans have been hoping that Diablo 2 will be the nest game on the remaster list. Though series creator David Brevik has mentioned that it’s a bit more complicated than simply being on the list. The suggestive wording in the posting has since been taken down, but it was preserved by Blizzplanet. 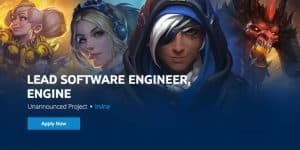 According to the latter, the job’s introduction states that the applicant must have experience with intense multiplayers like StarCraft, Warcraft III, and Diablo 2. The current posting does not mention any titles whatsoever and appears to be entirely reworded, rather than simply edited to take out the revealing sentences. Thus, this rumor should be taken with a healthy helping of salt. The source is not entirely clear and the Blizzplanet’s original post does not mention the removal of the quoted lines. It would certainly be a huge undertaking if Blizzard really was making a remaster of Diablo 2, and certainly warrants the hire of a software engineer team.